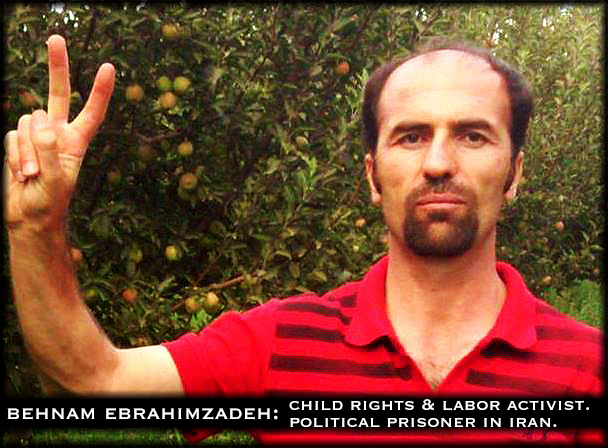 Behnam Ebrahimzadeh, a child rights and labor rights activist in Iran, has been held as political prisoner as a result of his activism, on charges of gathering and collusion against the regime, since June 2010. He has been subjected to an array of the abuses that the regime is capable of visiting upon political prisoners, including physical and psychological abuse, brutal attacks by prison guards and security forces on multiple occasions, isolation in solitary confinement, denial of urgently-needed medical care, and transfer from the political prisoners’ ward in Evin Prison to a segregated ward for dangerous criminals in one of the most notorious prisons in Iran, Rajaei Shahr (Gohardasht) Prison. While Behnam is currently serving a sentence of 5 years on specious charges, on December 3, 2014, the regime recently leveraged new charges against him of causing unrest in prison, holding connection with Ahmad Shahid (the United Nations Special Rapporteur on the Human Rights in Iran), and holding connection with a political organization. Such charges are being pressed in an effort by the regime to extend Behnam’s prison sentence. After his court appearance, Behnam was again transferred to Rajaei Shahr Prison. Given the continuation of incessant abuses against him by the regime, Behnam Ebrahimzadeh has been forced to go on a hunger strike since December 3, 2014. His sole demand is to be returned to the political prisoners’ Ward 350 of Evin Prison. As a result of the deplorable conditions in prison, the many beatings he has sustained, and a long hunger strike, Behnam’s health condition is precarious and his life is in danger. We at Mission Free Iran join our voices with those of many others calling for international activists and advocates for human rights worldwide to support Behnam Ebrahimzadeh through an e-mail campaign. Below we provide a brief text and the relevant email addresses for the Iranian regime as well as the UN. Given Behnam’s dire health condition, we ask you to take action as soon as possible. I am writing to support political prisoner and rights activist Behnam Ebrahimzadeh and his demand to be transferred immediately to Ward 350 of Evin Prison. I further demand the immediate and unconditional release of Behnam Ebrahimzadeh and all other labour activists and political prisoners being detained in Iranian prisons. Abuse of political prisoners must cease, and regime-sponsored harassment of labor, political, and other rights activists must end. Benham only spoke his mind.